This Edge-Lit Sign Supply With Radiating LEDs Gives Your Custom Advertisements an Advantage Over The Rest! Shop From Over 200 Sign Supply Models in Our Fast-Ship Online Warehouse! Easel brings your marker board up to eye level! Illuminated 25" x 18-1/4" marker board features thirteen different lighting effect settings! 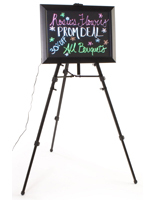 Full marker board kit includes black dry erase board, easel and neon marker set for your convenience! This personalized sign supply for liquid chalk pens, also recognized as a menu exhibit, sports LED edge-illuminated technology with red, green, and blue lighting on one side of the framing to spotlight written subject matters. This lighting alongside with the neon marker pens makes this signage stick out from other signs. Once the sign supply with illumination patterns is plugged in, it has thirteen (13) varying flashing lighting effect patterns that one can utilize! Every pattern will produce a varying color effect on a liquid chalk color! 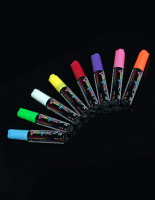 The marker pen signage also comes with a durable aluminum easel to bring your chalk marker communication into the line of sight for clients and customers. This easel uses a sliding clamp system to secure the display exhibit exactly where you need it! You can orient this illuminated sign supply with hanging hardware in either horizontal or vertical directions. The signage exhibit can even be utilized independently! This sign supply that illuminates subject matters comes with tools for wall-affixing and ceiling suspension! Discover the ideal location to put this panel. 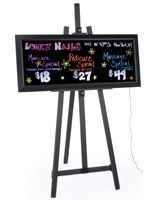 A flexible write-on menu display, sign supply that flashes lights is an optimal pick for your company! This sign supply is a superior addition to your present sign showcases. 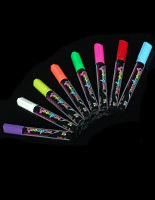 This neon panel is suitable for businesses that prefer updating their messages frequently. The sign supply that features twinkling sights are often utilized in commercial shops, eateries, and more. The optimal venues for placement are at entry ways so that clients shall be drawn in by the glowing signage. A sign supply, such as this marker board, is one of the more classic and effectively utilized menu showcases. This product is the optimal exhibit to appeal to clients and grab their attention. This tough sign supply in stock online permits sales owners and associates to design their own tailor made communication as often as they'd like. 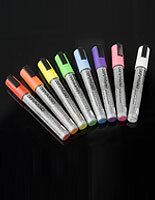 The write-on black panel exhibit comes with an eight (8) wet-erase liquid chalk kit and a soft, non-abrasive cleaning towel for fast and simple signage changes! 27.8" x 63.5" x 30.0"